The London based Saudi owned newspaper Asharq al-Awsat published a report by Ali Nouri Zadeh in which it claimed that Iran's President Mahmoud Ahmadinejad offered to assist Syria in conducting nuclear research during his visit to Damascus earlier this month. The story also listed a number of decisions taken during the same visit, all of which indicated a shift towards a more confrontational policy on the part of Syria and Iran; In addition to nuclear research there was development of biological weapons, Iranian financed purchase of a billion dollars' worth of Mig31 and SU24 advanced Russian fighters and 400 of the 1971 model T-72 Tanks! (not T-90?). In exchange for Iran's generous offer, President Assad supposedly promised his Iranian counterpart to stop seeking a peaceful settlement with Israel. (Israeli) Minister of Strategic Threats Avigdor Lieberman on Saturday called for the establishment of an emergency national unity government in light of the strategic threat posed by the tightening ties between Syria and Iran. The Likud party, Netanyahu, did not embrace Lieberman's call for an emergency unity government. "The Likud's stance hasn't changed. We are working toward holding early elections," a party statement said. However, it appears that Kadima, the party headed by Olmert, is ready to consider joining the opposition in a national unity government. Chairman of the Knesset Foreign Affairs and Defense Committee Tzahi Hanegbi (Kadima) said "the continued oppositional and adventurous policies of the 'axis of evil' states, requires strategic thinking among central Israeli powers." He added that there are similarities between Israel's current situation in the face of Iran, and the situation Israel faced 40 years ago on the eve of the Six-Day War, and back then an emergency government was established. He said that then, like today, a fundamentalist yet inexperienced regime was developing in Arab nations, and it could result in confrontation. First, the figures: in order to procure the weapons and equipment mentioned in the report, especially the MiG-31E fighters and the 400 T-72 tanks, Syria needs four or five times the sum that it is allegedly receiving from Iran. Syria still owes Russia $3.6 billion (even after Russia wiped out 70 percent of Syria's debt for 2005). So, where will Syria find $4 billion to fund the rest of the deal? There is no answer to this conundrum. Later, an Israeli official denied the content of that story. Iran denied it as well. Finally, today I received an email from Yoav Stern that he received from the editor of a "Syrian opposition" site called syriatruth.org. The editor was asking Yoav to read an online story that Syriatruth reported 8 months ago (Dec 2006). Apparently the story reported in Asharq al-Awsat this week is almost identical to the original story in Syriatruth.org. For those of you who can read Arabic, Here is the Asharq al-Awsat story last week, and here is the Syria truth story in December 2006. Now, it might be useful to take another look (above) at the reactions of the many alarmed Israeli politicians who promptly accepted this fascinating story without questioning the reliability of the sources. Expect to see more of this kind of propaganda. Two years after claiming to withdraw, Syria still occupies up to 180 square miles (4.5%) of neighboring Lebanon and smuggles arms to militants there, says a report by a Lebanese democracy group. Current and former U.S. officials, along with regional experts, say the findings of the report are credible and largely in line with U.S. intelligence. The report was put together by the International Lebanese Committee for U.N. Security Council Resolution 1559, a private group of Lebanese businesspeople, democracy advocates and exiles. Surveyors scrutinized the central and northern two-thirds of the 227-mile border between Lebanon and Syria. The southern portion, patrolled by United Nations peacekeepers under a cease-fire agreement that ended last summer’s war between Israel and Hezbollah militants, was not surveyed. Daqduq is not alone, say U.S. military officials and others who keep tabs on Iran’s activities in Iraq. According to the People’s Mujaheddin Organization of Iran (PMOI), a longtime opposition group to the regime in Tehran, as many as 500 Hizballah operatives are at work in Iraq training militiamen at the behest of Iran. The PMOI, which claims to have an extensive intelligence network in Iran and Iraq, says most of the Hizballah operatives in Iraq are serving as trainers or assistant trainers to the Mahdi Army, the Shi’ite militia of firebrand cleric Muqtada al-Sadr. According to Scott Ritter (“Target Iran”), PMOI/MKO is working very closely with Israeli intelligence. OK. Expect to see more of this kind of propaganda too. “When I got on the plane on the way to Israel, I immediately felt calm and secure. In France I was always worried when my children went on the underground on their own, or even just wandered the streets. I always dreamt of immigrating to Israel; I feel safe here,” Jacklyn Benishu said Wednesday morning after landing in Israel as a new immigrant. Benishu arrived with 600 other new immigrants from France on two planes which landed at Ben-Gurion Airport in the morning. May we consider heisting your post for SMCification? I actually had read that Israel denied the Al Sharq Al Awsat report. The senior defense official also said that a report of a $1 billion arms deal between Syria and Iran is false, saying that Russia – not Iran – is Syria’s main weapons supplier. “[Iranian President Mahmoud] Ahmadinejad’s visit [to Syria] was simply designed to maintain the axis between Iran, Syria, and Hezbollah,” said the official. The official maintained that Syria is seen by both Iran and Hezbollah as the “weakest link” in their ties, which may break away from them should that be in its interest. However, the official emphasized that “at any given time” there are Iranian and Hezbollah representatives in Syria to coordinate their actions. 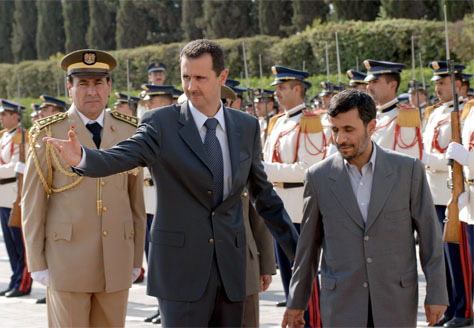 On Saturday, the London-based Arabic language newspaper Asharq Al-Awsat reported that Damascus and Tehran had signed a strategic cooperation agreement during Ahmadinejad’s visit to Syria late last week. The report describes the cooperation between the countries as including military, economic, scientific and technical aspects. The electricity in Homs and other syrian cities has been in an outage mode for most of this summer “ over 15 hour” .. and it’s not Due technical issue..
ONLY the Mayers, and other official in the city have electricity..
Can Iran Help providing electricity !!!!!!!!! The head of American intelligence, Admiral (ret.) Mike McConnell, revealed a secret a week ago: Hezbollah sleeper cells are waiting in the United States for the order to carry out terror attacks. The unclassified version of the intelligence assessment, the one distributed to the public, has been stating for years that Hezbollah has the ability and intentions to act against American targets and assets. However, this description has been vague enough to deceive the public into thinking that attacks are expected only in Lebanon and other places in the Middle East. McConnell, who crafted his speech on the fly while on the way from the White House to another location in Washington, tripped up and let slip what the American intelligence community had discovered from its sources and was trying to hide. The difference between the two versions is significant for the American citizen. Attacks on his soldiers in Iraq, Afghanistan and other ends of the earth have become routine. This is not the case if inside America they are on the alert for terror acts by underground cells. Ostensibly, it is a considerable intelligence achievement if the Central Intelligence Agency has acquired information about Hezbollah’s emergency plans. On the day the attacks come, the surprise will not be total. But this is a deterrent rather than a warning, and the true achievement belongs to Hassan Nasrallah, his operations officer Imad Morniyeh, and the dispatchers in Tehran who want to frighten Washington to the point of thwarting a military initiative against them. In this complex game, the big winner could well be Syria. The expected trigger for Hezbollah attacks, both in the secret assessment and the censored version, is if America or Israel crosses what McConnell calls a “red line” as far as Hezbollah is concerned: an attack on Iran. A response to this will shed American blood. Politicians will have to explain to the public, the day after a bombing in Iran and reprisals in Detroit or Los Angeles, why it has brought down this unnecessary trouble, which intelligence had warned about, on the tranquil civilians between the two oceans. The recent past has taught the Iranians that the Americans, like cold business people, tend to cut their losses and get rid of failed investments. They were defeated and they surrendered after the takeover of the embassy in Tehran. Two attacks on the embassy in Beirut and one on the Marines at the airport at Khaldeh expelled the Sixth Fleet from Lebanon’s shores. The kidnapping of its citizens led the Americans, with Israel’s help, to sell arms to the Iranians in their war against the Iraqis. You don’t have to be Pavlov to recognize a behavior pattern here. This is precisely why Syria is so important to the administration of President George W. Bush in its ability to influence important sectors: Iraq, Iran and Lebanon. The administration’s top priority this quarter, which ends in September, is in Baghdad. The report by the commander of the forces there, General David Petraeus, is due on the implementation of American policy in Iraq. These efforts are characterized by an escalation meant to improve the situation; achieving victory there is an illusion that has long been abandoned. The forces have been beefed up and have been leaving their bases in attempts to kill their enemies. The result has been an increase in the number of American casualties, many of them because of the expertise that has been flowing in from Iran, whether directly or via Hezbollah and through the Syrian border. To weaken the front against him, Bush aspires to release Syrian President Bashar Assad from Iranian President Mahmoud Ahmadinejad’s embrace. A signal from Assad about a less anti-American policy will find an ear in Washington, in the spirit of the recommendations of the Baker-Hamilton report last fall. It could be that a real renewal of a Jerusalem-Washington-Damascus dialogue will come only after the stabilization of new administrations in Israeli and America. An especially intriguing possibility could be a Clinton-Assad-Barak trio, with Hillary instead of Bill, Bashar instead of Hafez and the new Ehud, an embodiment of the old Ehud. But even during the period the Bush administration has left, it is worth relating to the messages being exchanged in the American-Syrian channel not as expressions of rigid hostility, but as bargaining stages. It is childish that the US and Israel expects Syria to abandon its ever powerful ally Iran for the flimsy promises of the return of Golan after years of insults, sanctions, threats against Syria. If the US has a very long memory of the humiliations they lived ( 9/11, the US hostage in Iran, the bombing of the US embassy in beirut, the failure of Iraq etc..) so do the Syrians. Arrogantly the US expects that just because they are powerful they can humiliate countries and expect gratitude. If the US has a very long memory of the humiliations they lived … so do the Syrians. Please feel free to list the “humiliations” the Syrians have had to endure. It must be tough. “Israel is so important to Turkey… it is at the very top of Turkey’s foreign policy,” Erdogan said. “We see Israel as our number one county that we trust, it plays a very important role in our considerations,” the Turkish ambassador added. Do you have link for the Erdogan statement on Israel? Thanks. “Humiliation” is a big word, but Syria which refuses to act like another puppet Arab state to the US, has been exclusively targeted by the American and Israeli (and Saudi) media since the 80’s on and off. There is a constant negative media campaign such as the invented article that appeared in Asahrq al-Awsat .. notice how they added all the necessary spices to the story .. like Syrian Iranian nuclear cooperation! 3) Syria still has some intelligence presence in Lebanon. No mention that every country from France, to Sudan has spies in Lebanon. No mention that US, Saudi and French ambassadors give instructions to Lebanese politicians on a daily basis … it is Syria which is interfering in Lebanese affairs. 4) We know that Israel unnecessarily killed over 1000 innocent Lebanese civilians last summer .. yet it is Syria’s “alleged” killing of Hariri that gets the international tribunal. 5) Chirac supposedly gave up on talking to the Syrians because he was very disappointed in the slow reforms and in Syrian corruption (a popular story), yet this Saudi prince who got 2 billions commission on his country’s purchase of one arms deal from England, still meets with Vice president Cheney and is a family friend to the president. It is alright, we got used to the stupidity and silliness. But the danger lies when governments start believing their own invented stories about Syria … the way some Israeli politicians reacted to the Asharq alAwsat story and trusting it blindly, the way American administration officials supposedly made the wrong conclusions about how Iraqis will receive their troops based on what they read from some “liberal” (Pro American) writers in Asharq al-Awsat. The increasingly radical line adopted by pan-Arab Saudi media is particularly valuable to US policy in the Middle East now that its own communication strategy for the Arab world has failed (11). The convergence between Saudi and US media interests explains why the Middle East Media Research Institute (12), an Israeli thinktank that translates extracts from the Arab press, is so keen on journalists writing for the Saudi press. The widespread distribution of such translations is part of a sophisticated strategy to manipulate information. inventing an imaginary Arab world that supported the US invasion of Iraq in 2003 and the Israeli attempt to eradicate Hizbullah in Lebanon. They are increasing the flow of misleading signals to US politicians and media framing US Middle East policy. Whether it was a chance encounter, an ambush at the men’s room, or a carefully staged first meeting, the U.N. ambassadors of Israel and Syria walked side by side and may have exchanged words for the first time yesterday. Israel and Syria have been passing messages in recent months, largely through international mediators, to explore the possibility of resuming peace talks. Israeli Ambassador Dan Gillerman told reporters he had shaken hands and spoken with his Syrian counterpart Bashar Ja’afari when the two met in a hallway yesterday outside the U.N. Security Council. “That’s the first time we spoke,” said Gillerman, who has been Israel’s ambassador since the start of 2003. The two were seen walking from near the men’s room outside the Security Council into the antechamber of the council. Ja’afari, however, denied he had spoken to Gillerman. “I wasn’t walking with him … he was following me,” he told reporters. The encounter took place at a spot where reporters gather to speak to diplomats going in and out of the council. An official at the Israeli mission said the two ambassadors met by chance while Gillerman was taking a group of Israeli schoolchildren on a tour of the United Nations. Haaretz had several articles about that report. Haaretz also often changes the articles in internet when it gets more information. The aim of propaganda is to plant stories in the world media. Later if the story is found to be untrue and complete fiction it doesn’t hinder the true believers to reuse the fake news. Like that story last year that Jews living in Iran are demanded to use a marking in their clothing. When the Jews in Iran angrily denied that the story vanished from main media but it keeps on living in the writings of the worlds “Akbars”. The circular system of pro Israelis is extremely talented in that kind propaganda spreading. One informs of “breaking” news and others quote it. Seems that the Saudi press has joined that “news generating” ring. Hmmm Akbar lucky that those French came before the general strike stops the traffic. Lets see how long those French stay in Israel before following the example of Avraham Burg and move to France. Interesting man this Avraham Burg – A Zionist politician loses faith in the future. The former speaker of Knesset, leader of the World Zionist Organization and the Jewish Agency for Israel. More than 4,000 Israelis received German citizenship last year, marking 50 percent increase from 2005. ‘For me it is important that I can have a European passport; I have no problem being German,’ 30-year-old Israeli says. Estimates show that some 300,000 Israelis may be eligible to become German citizens. Seems that the secular educated Israelis are leaving and new religious extremists are coming. It would be extremely interesting to know how many Israelis have two passports and how many of Israeli Jewish citizens actually live in Israel. Sometimes reading the comments in Haaretz and Jerusalem Post it seems that the majority of most radical and extreme supporters of Israel live abroad. Like you Akbar. Current and former intelligence officials say the Bush Administration’s National Intelligence Estimate regarding terrorist threats to the United States does not provide evidence to support its assertions and may have inflated the domestic threat posed by the Lebanese political and military group Hezbollah, perhaps because it receives financial support from Iran. Josh Marshall, commenting on Steve Hayes’ book, recently spoke of Cheney’s wildly improbable fantasies (“Cheney, More Than a Little Paranoid”, TPM, 07.23.07). I don’t know about you, but things are looking up. 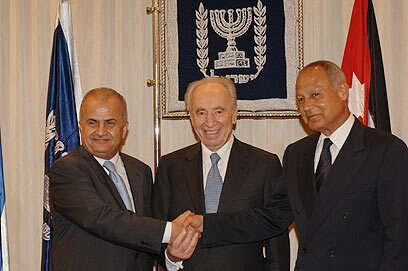 Turkey, Eygpt, Jordan, the Arab League, Abbas. Now that the fundies are painting themselves nicely into a corner, the Arab/Muslim world is splitting between those that are tired of violence and extremism and those that thrive on it. Arabs and Muslims don’t want to live in a world of suicide bombs and rocket propelled grenades. And they shouldn’t have to. So .. no humiliation, because we know what Syria is, but disappointment. So Syria has actually fallen from the great country she is to the deep recesses of “disappointment”??? Still, I do not recall a single missile being fired into Syrian terrortory over, say, the past 20 years. So yes, Syrian security seems to have “lucked” its way to the 21st Century…. I am glad that Akbar admits that the USA has suffered “humiliations” because the US press will never use this word! I am also glad that Akbar expresses that Syria has never been subjected to “humiliations”. It shows that the “Corrupted” “Dictatorship” Syrian Regime has kept its pride safe and its people’s pride intact. That is an achievement to the credit of the Assad’s, isn’t it? The americans can’t say the same about the Bush administration after the ridiculous premature hurrahs of victory and the pathetic and murderous fiasco of the Iraq invasion. The Israelis either when the IDF, recognized to be one of the most powerful army in the world shows its impotence in front of a few hundreds peasants turned soldiers. It shows that the “Corrupted” “Dictatorship” Syrian Regime has kept its pride safe and its people’s pride intact. Yes, I didn’t think Syria had to much to complain about, except, perhaps, their economy, government, and their loss of a strategic land mass. I’m glad these little things don’t affect Syrian pride. Akbar habibi the point of this post is that a lot of what influences western opinions of Syria is based on thousands of bogus charges made up in Saudi, Lebanese Jordanian Kuwaiti (Arab moderates) newspapers. You and your friends absorb it and accept it without questioning for a second the motives of those sources! Like the way Asharq’s opinion writers (Pro American) gave this administration the impression that American troops will be greeted with flowers in Baghdad! If this administration will continue to ONLY read the opinions of its friends and trust them (and trust no one else) blindly (Michael Young!) … we will have more and more messed up Mideast policies .. this is serious… it is not only that they refuse to talk to their enemies, they also refuse to listen to them, and it starts with their second biggest mistake in the Middle East (after the Iraq war) … seeing Syria as an enemy to the United States. Michael Young on whom you and your agent friend have a fixation (inferiority complex), does not kill people. Your paymasters in Damascus do. You are criminals, he’s a smart analyst. No, I do not have a fixation on your friend … I only use him as a vivid example of the mistakes. HE has a fixation on Syria … he is always there … he dedicated most of his articles to damaging Syria’s reputation thinking and hoping that will lead to his desired goals … it is not leading there. Did I mention him in my original article? in the one before?